Kristina LaCelle-Peterson writes a compelling outline of Christian feminism that serves as a valuable tool for the average evangelical seeking more refined and informed thinking about gender from a biblical perspective. The book's title hints at its ambitious purpose: to liberate evangelicals from cultural trappings that have misdirected our reading of Scripture, our family structures, and our models of church participation. The author invites all Christians to look at Scripture with fresh eyes and to listen to the voices and experiences of Christian women through the ages so that we can gain a more accurate understanding of gender as it relates to Christian identity and vocation. Having cleared the way with exegesis and historical research, she issues a clear call that her readers begin to construct a way forward that recognizes that both men and women are created equally in the image of God and are meant to carry out God's purposes in the world together. LaCelle-Peterson's approach to Scripture is thoroughly evangelical and in line with CBE's position that "the Bible, in its totality, is the liberating Word that provides the most effective way for women and men to exercise the gifts distributed by the Holy Spirit and thus to serve God." Rather than viewing Scripture as an oppressive text, the author builds her case for full gender equality based on an approach that asserts that "Scripture, rightly understood, is affirming of women's full humanity and full participation in the people of God" (21). The Bible then becomes the liberating force behind the book as a whole. Fallen human culture, and its frequent presumption of gendered hierarchy, must then give way to the ancient and liberating message of Scripture. 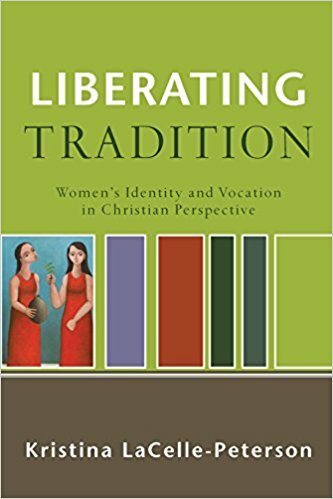 In this vein, Liberating Tradition begins by putting forward a clear and concise biblical theology of gender equality in the first two chapters. LaCelle-Peterson roots this view of women's identity in a capable exegesis of Genesis 1 and 2 and continues by giving attention to the variety of roles, offices, and tasks that have characterized the women presented in the biblical text. Although only cursory treatment of most passages is offered, the broad scope of the author's investigations successfully achieves her intended effect. Her whirlwind tour of female judges, prophets, disciples, and deacons serves to challenge male-centered readings of Scripture. The combined weight of the plethora of examples given in the book should weaken the culturally constructed blinders that have allowed some evangelicals to interpret female church leadership as a new development manufactured by modern liberals. The book continues to include careful study of Scripture as it explores women's identity in the Christian family and the usefulness and limitations of gendered metaphors for God. Liberating Tradition is not, however, simply a survey of Scripture. It also offers keen sociological and historical insights that push its arguments forward. In fact, the strength of the book lies in the author's recognition that deep-seated cultural attitudes reflect and contribute to distorted perceptions of Scripture and tradition. In one of her most intriguing chapters, titled "Mistaking the Industrial Revolution for the Garden of Eden," LaCelle-Peterson challenges the legitimacy of what many assume to be "traditional" marriage. She asserts that the phenomenon of a breadwinning husband leaving the home to work and a domestic wife taking care of household duties is a highly localized historic occurrence produced by the specific economic and social forces of the Industrial Revolution. Such a statement calls into question views of "tradition" that many Christians take for granted while simultaneously infusing the Christian community with a more accurate shared heritage that sparks our imagination as we together seek to realize God's intention for the full participation of women and men in God's kingdom. By parading a wide variety of texts and arguments before her audience, LaCelle-Peterson convinces us that there are vital Christian voices we have not been hearing. Her book will confront those who remain unwilling to embrace a position of biblical equality with informed arguments and voices that are deeply subversive to the theological legitimization of "traditional" gender roles. The broad scope of the book commends it to be used as an introduction to the Christian discussion of gender. Such a work would be an ideal text for college or seminary courses on pastoral ministry or gender, local church book studies, or Sunday school classes. It is also a perfect recommendation to any Christian newly grappling with issues of gender in the context of Christianity.